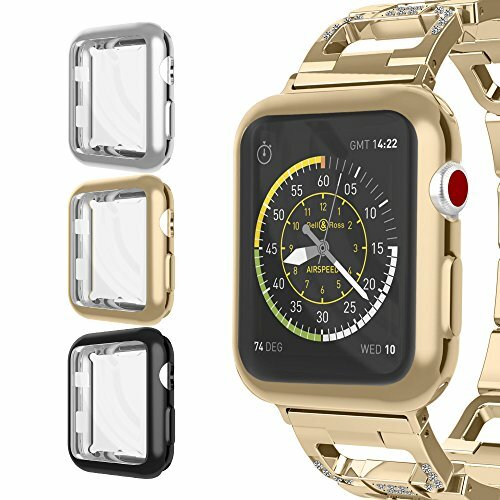 UMTELE Flexible Cases Offer Not Only Reliable Protection Against Scratches But Also Sleek Look to Your Apple Watch! 1. Integrated screen protector, thin and ultra clear. 2. User-friendly design for quick and easy installation. 4. Precise cutouts for quick access to screen, button and sensor. 5. Electroplated surface aims to make your watch more elegant. 6. Slim and lightweight, add negligible weight to your watch. 7. No need to remove the case before changing bands or charging. Notice: This product does not include Apple Watch and watch bands.